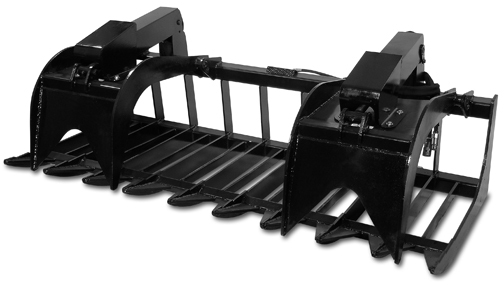 Our Heavy Duty Root Grapple are built from 1/2" thick steel plate on the top and bottom. We also incorporate 3" square tubing. The CID heavy duty root grapple recommended machine size is 45 – 65 hp. Our heavy duty root grapples are our top selling root grapple because most people own the 45 – 65 hp skid steer machines. This heavy duty root grapple picture is shown with optional spacer tines and optional bolt on cylinder rod cover kit. What makes this root grapple different is the thickness of the steel plate which is 1/2" top and bottom compared to our Standard Duty RootGrapple which is 3/8" top and bottom. The tubing on both of these series are 3" square. While our X-treme Root Grapple is made of 5/8" steel on top and 1/2" on bottom and incorporates 4" square tubing. This is to insure you get the right root grapple attachment for the right size skid steer machine. 1/2" thick steel plate on the top and bottom. 2" bore by 10" stroke cylinders.